Is Your Supply Chain Ready For The 'End of Silicon'? Is Your Supply Chain Ready For The ‘End of Silicon’? I don’t mean that the world is running out of beach sand, the abundant source of silicon — though chipmakers are actively investigating new materials for integrated circuits. I’m referring to “silicon” more broadly; the unique materials, especially the so-called rare earth elements, that are integral to the devices and technologies we’ve come to rely on in our businesses and our lives. From dysprosium in hard disks to erbium in fiber optics, from lanthanum in batteries to lutetium in circuit development, from neodymium in audio speakers to yttrium in liquid crystal displays, some rare earths are indeed becoming rare — while up to 97 percent of supply is controlled by China alone. Think such resource scarcity doesn’t apply to your business? Think again. As chips, sensors, and other Internet of Things (IoT) technology become crucial to everything from automobiles to washing machines to entire manufacturing processes, such resource scarcity will affect every supply chain. That means manufacturers need to respond — sooner rather than later. The naysayers will dismiss talk of resource scarcity as short-sighted. After all, the end of oil never came, as hydraulic fracturing and horizontal drilling have produced so much oil and natural gas that prices recently reached surprising lows. Still, oil-and-gas heavyweights such as Saudi Arabia recognize that we may be reaching the end of the oil era. The doubters will also insist that market dynamics naturally drive solutions to resource constraints. For example, when chlorofluorocarbons (CFCs) were regulated out of usage for refrigerants, innovators developed hydrofluorocarbons and other alternatives as replacements. But it won’t be so easy when it comes to the unique materials that underlie information technology. IT is embedded in modern life like no technology that has come before. It’s not just in the devices and equipment that run our businesses, from smartphones to data-storage devices to the Internet itself. It’s also in virtually every “analog” device you can think of, from acoustic guitars to running shoes, from toothbrushes to toasters. If your company makes something today, it not only depends on IT in the manufacturing process; it also bakes IT right into the final product. And with burgeoning demand from emerging economies like China and India, resource scarcity is just getting started. Supply chain transparency — First is simple awareness of how reliant both you and your suppliers are on rare earths and other potentially constrained resources. Trace material flows throughout your entire value chain. Keep a close eye on supply and demand so you can take proactive action should an emerging constraint threaten vital operations. Material and product innovation — Continuous innovation will be increasingly important as manufacturers respond to resource scarcity. That starts with appropriate investment in engineering and R&D to either identify alternative materials or develop successful products based on more abundant resources. It continues with continual re-evaluation of business processes and models that can meet customer needs without the constraints of scarce resources. Extended product life cycles — Sustainability will become increasingly important, and not just because it’s good for the environment and for economies. Engineering will need to design products that last longer and maximize the return on investment in scarce resources. That effort might also have to involve marketing, to shift customers from a mindset of planned obsolescence to emotionally endurable designs and brand affinities. 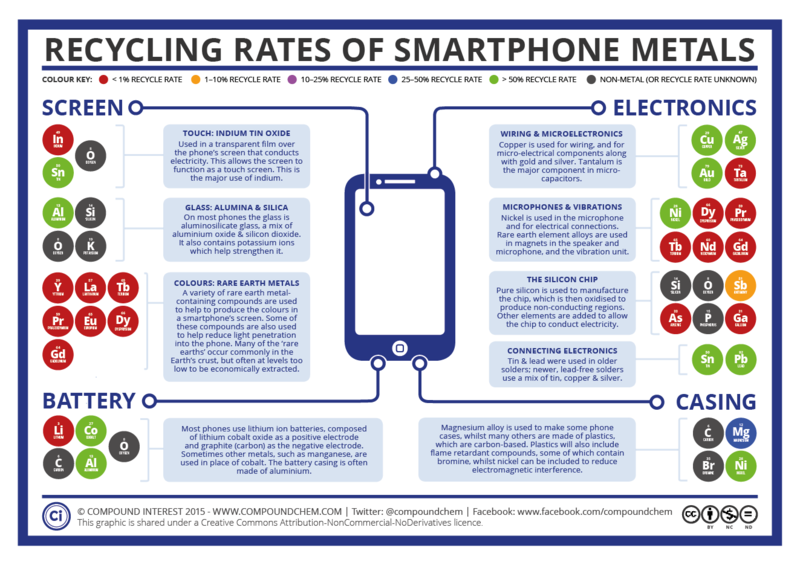 Aggressive materials recycling — While electronics recycling has become big business, a surprising amount of rare earth metals are simply discarded — in some cases, with recycling rates of less than 1 percent. That will have to change, but it won’t necessarily be easy, as it can be difficult to separate valuable substances from hazardous materials in e-waste. Manufacturers — both as individual companies and working across their respective industries — should work toward optimizing recyclability. That may have to start with engineering, building ease of recycling into product design. Ultimately, response to resource scarcity will require a cross-disciplinary approach. Scientists, companies, industry groups, and governments will need to collaborate to ensure that resource scarcity doesn’t hinder innovation, business, and economic growth. But unless your company is ready to embrace the “end of silicon,” you should start thinking today about how you’ll respond to potential resource scarcity throughout your supply chain. For more insight on supply chain strategies, see Zara’s Agile Supply Chain Is The Source Of Its Competitive Advantage.